And what do you know? With the magic of the internets and the power of #ThrowbackThursdays, we bring to you our second summary of our amazing Japan trip. 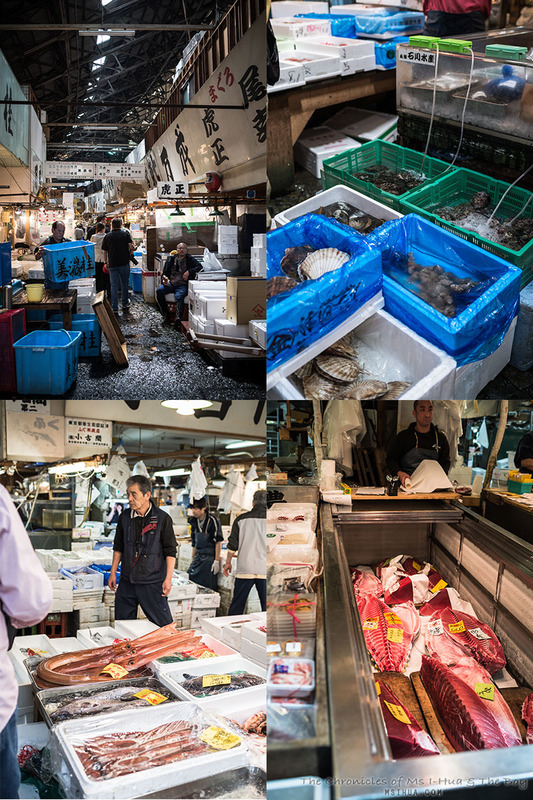 Still concentrating on Tokyo, this time, we bring you with us to Tsukiji Market and the magic of fresh seafood. 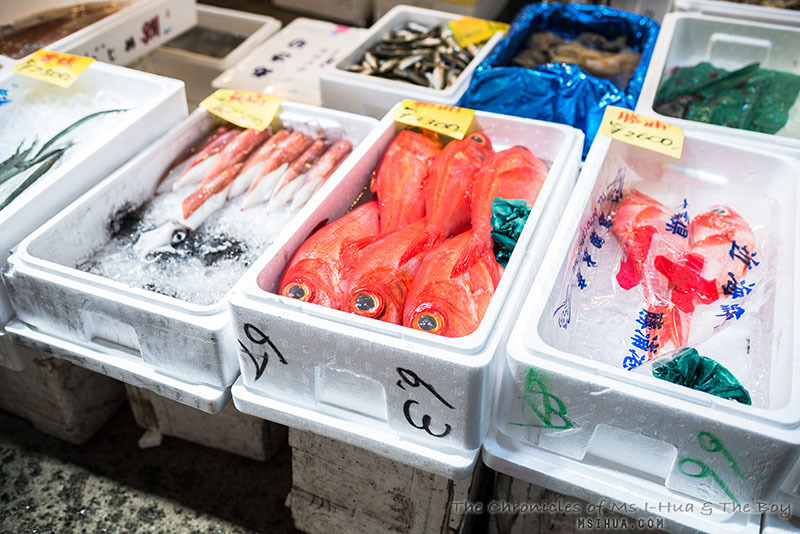 We had tossed and turned on our options for visiting Tsukiji Market. Famed for its Tuna Auctions and fresh seafood, we couldn’t really decide if we would give up on our precious sleep for an early wake-up call to trek to the market at 4:00am. Yes, the tuna auctions start early, and if you don’t get there by 4:00am, you tend to miss out on most of the action. The advice for those of you who want to head out there and view the tuna auction (which starts around 5:20am), skip the night’s sleep and go straight on to the market. Once done, start lining up for the famous Sushi Dai, with queues up to 3 hours long (wait time) should you miss out on being there early. We did neither of these things. It was our third day into our trip and at the very start. We didn’t feel like we wanted to push it and wreck ourselves before the rest of our trip started. That being said, we still woke up pretty early and got there just before 8:30am. Instead of looking around and wasting our precious time, we walked straight for the Sushi Daiwa line (Sushi Dai is run by the father :)). 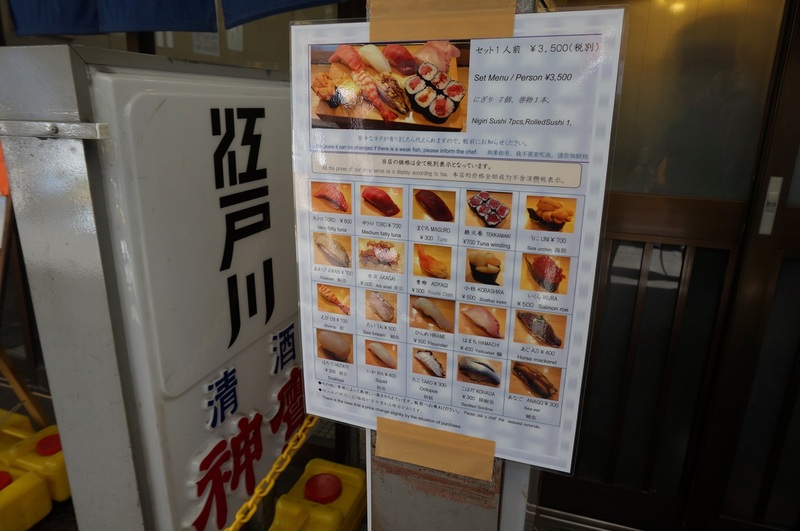 The easiest way to get to either Sushi Dai or Sushi Daiwa is to turn right, once you exit the train station (left if you want to go into the fish market first). By turning right, we managed to jump ahead of several others who took the longer turn into the market (HAHA!). If you need guidance on how to get to the market, visit Japan Guide for a comprehensive guide, including train lines, opening hours, and shops. It even has a map of both the inner and outer market so that you can familiarise yourself with the layout before heading over. 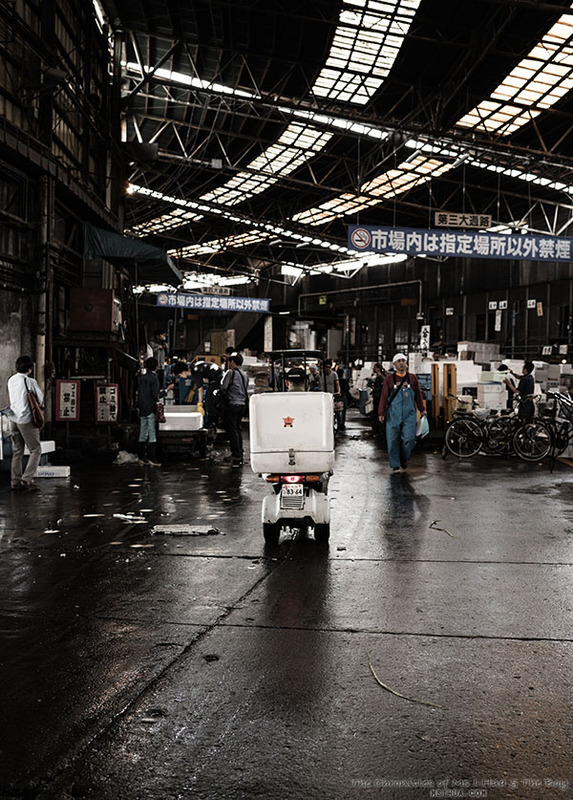 After our amazing breakfast, we took our time to walk around the fish market and discovered the market equivalent of a Segwey, albeit with a trailer and a motor. Be wary of them though, you could get run over by one if you aren’t paying attention! The market walk around is a definite must. Maz and I were so distracted by the many different sights, colours and sounds of the market and wanted to take all the pictures in the world. We just couldn’t get enough! 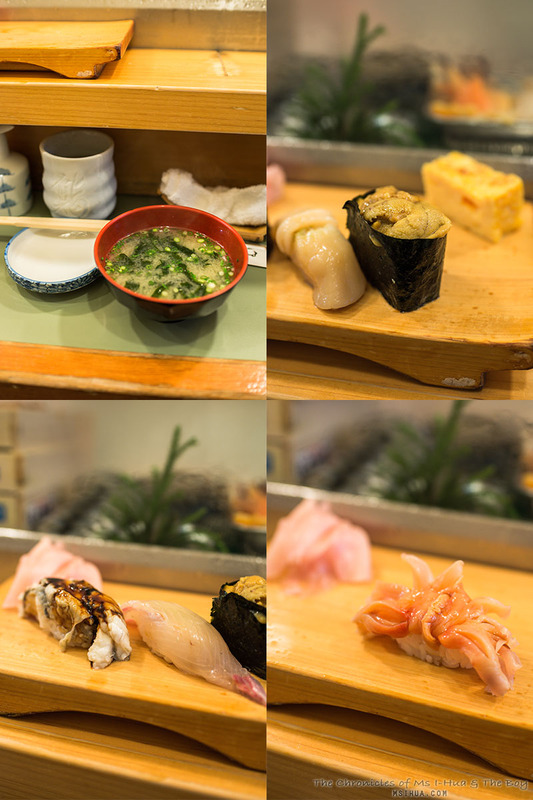 But we know you are more than hankering for a recap of our amazing Sushi breakfast. If you need to have sushi breakfast at 9:00am in the morning, you have come to the right market! Like I said earlier, we managed to get to the Daiwa Sushi line around 8:30am and waited for around 45 minutes before we managed to score a seating for three (some diners who were alone managed to get in before us, you just need to be accommodating for that). The total experience last about 30-40 minutes, and by the time we walked out with super satisfied bellies, the people waiting in line for Sushi Dai were still there! Hah! We opted for the breakfast omakase menu (for 3500 Yen), where our fates rested on the knowledge of the sushi chef. ZOMG! So amazing! You can view the menu here. The most amazing sushi we had was the two types of Toro (Tuna Belly) we had. A very fatty piece of tuna and a medium fatty piece of tuna. There was no comparison. The Otoro was to die for and was simply melt in your mouth amazing. We also had Uni (sea urchin), Hotate (scallop); Ika (squid); Tekkamaki (tuna winding); and my second favourite sushi to date. Anago. Friend of Unagi. 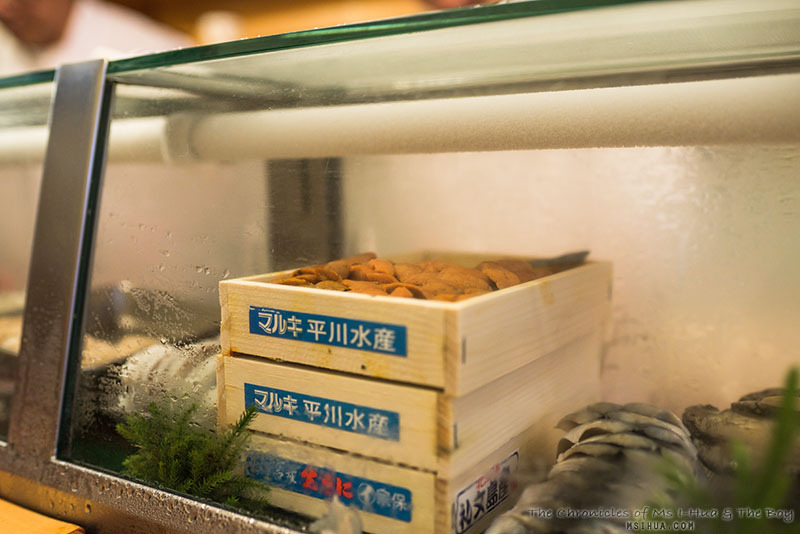 Whilst Unagi (fresh water eel) is more popular in today’s Japanese cuisine, Anago (salt water eel) is a delicacy I have never been able to try outside of Japan. It is 10 kinds of wow. The funniest part was when the sushi chef asked if we wanted any more sushi (at this point, we had finished our breakfast set), and mentioned that he had fresh clams. All three of us, thought he mentioned crabs! So we said yes. Instead, an odd crab-like piece of sushi landed on each of our serving trays. The sushi chef had such a pleased look on his face because we had been so excited thinking we ordered fresh crabs. Turns out, we had Akagai or known by several names. Arc Shell Clam, Blood Clams or Red Clam. It was really tasty still, but we were laughing so much. Drunk on fresh seafood! At the end of the meal, you are provided with a piece of sweet omelette (tamagoyaki) and a bowl of miso soup to finish off the meal. 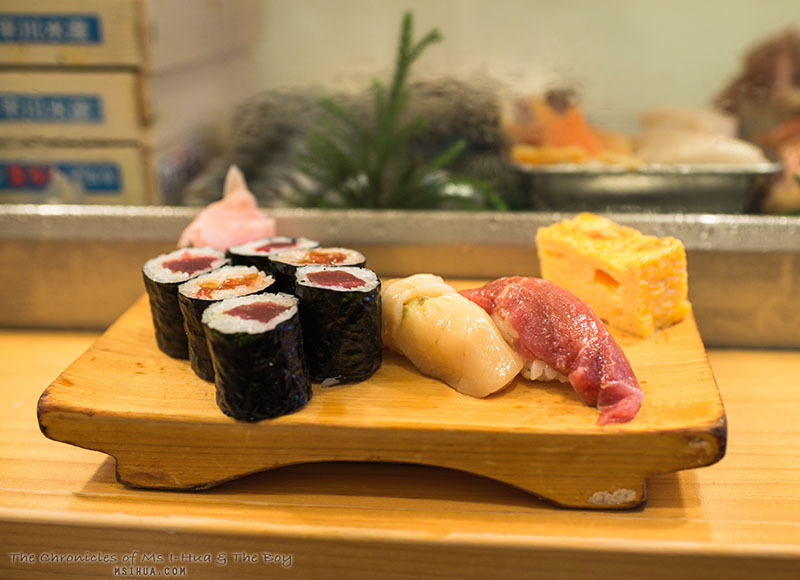 Would we ever go back to Tsukiji market for this? Most definitely so. 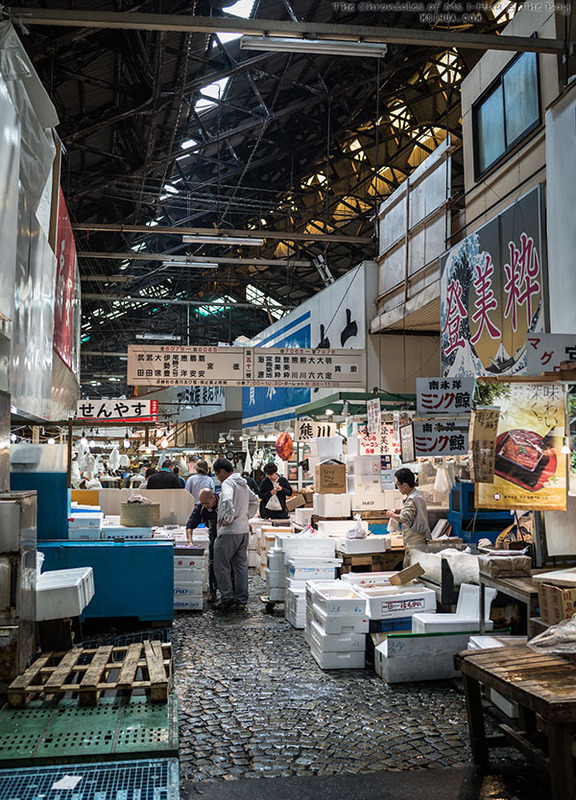 However, with the impending relocation of the market, the charm of visiting Tsukiji in its original location may be lost. If you are heading over to Japan before 2016, definitely make a visit to Tsukiji market before it leaves the original location forever.